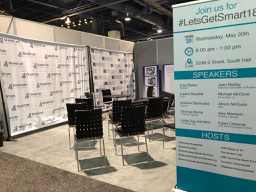 For the last two years at ICSC RECon, Perlmutter Properties along with QuantumListing, Donovan Real Estate, Benbrooke, Gladstone Development, the Broker List and others, have hosted a speaker series on Wednesday. If you’ve ever attended RECon, you know that most people use it as a travel day. In order to make the day productive and interesting for those remaining, we started the #LetsGetSmart speaker series. It is a great opportunity to hear about industry trends and network in a relaxed and intimate environment. This year, Howard Kline of CRE Radio & TV generously offered to video the talks, and even interviewed some of the speakers, which added a great new dimension to the event. I encourage you to spend some time reading through the excellent summaries written by Ben Perlmutter, which you can find by clicking on the links in the QuantumListing blog post, #LetsGetSmart Keeps Getting Smarter. If you find any of them particularly interesting, watch the videos of the talks that are embedded in the respective summary articles.